One starts to understand the complex tapestry that C. Lloyd and Fergus aims to create with plants. 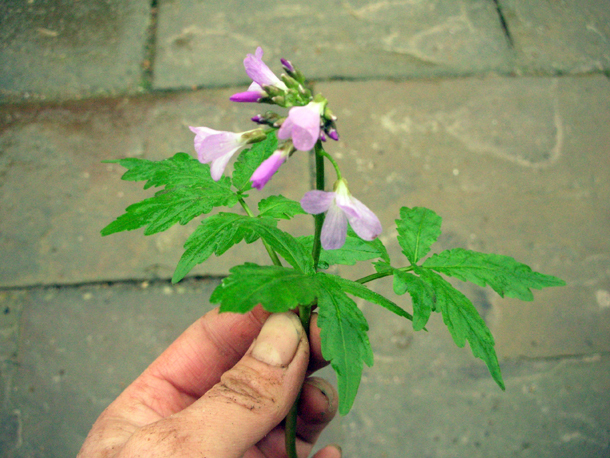 It has always given me great pleasure to stumble upon interesting wild flowers in the countryside whilst on walks. 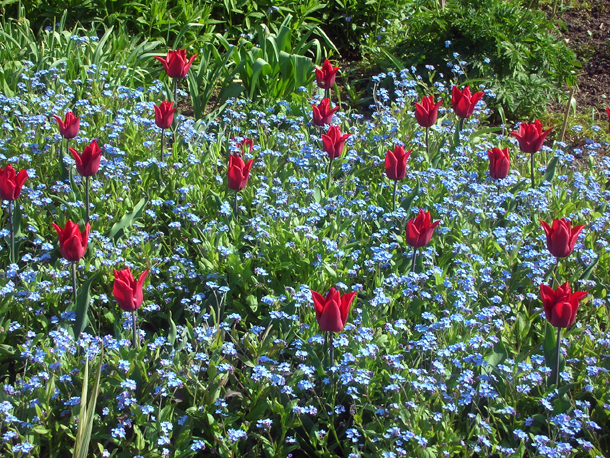 But recently I have been purposely going on expeditions to seek out specific wild flowers, which can prove elusive. 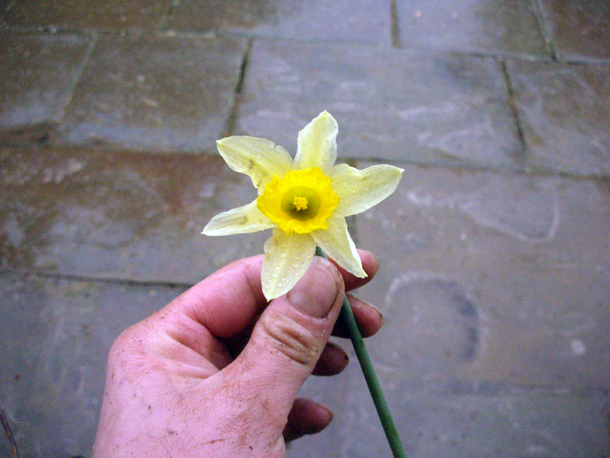 Narcissus pseudonarcissus - the wild one possibly native to us, is rare now to sight because of intensive agriculture. In a nearby woodland I managed to successfully seek what I wanted to find. 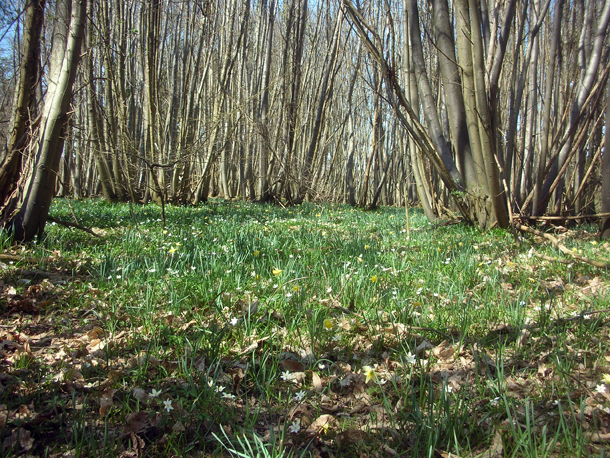 Like jewels they peeked through the carpets of white wood anemones and dried fallen leaves. They were spread out in this way that is so hard to mimic in the garden. In marvelled silence I sat and admired them. 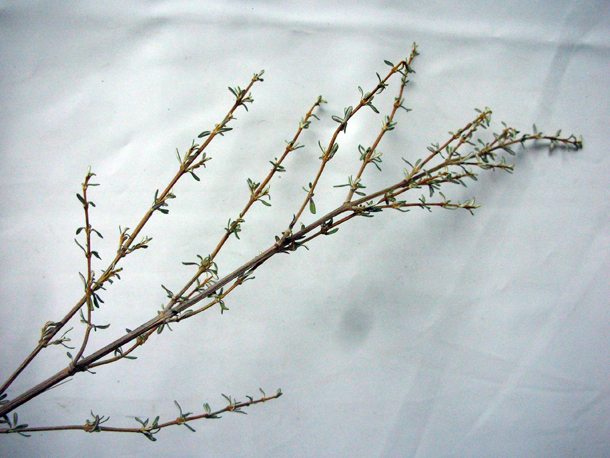 Many of this plant ident felt very fragile, precious and hopeful, as the first 'spring' growth valiantly started to appear even though we were still in the throes of winter. 1. Helleborus 'Anna's Red' (Ranunculaceae family). It has these amazing tight almost unreal red satin buds that bursts into a floriferous display, that lasts for a long time. It's April and still going! Their flowers heads don't turn downwards like they commonly do. 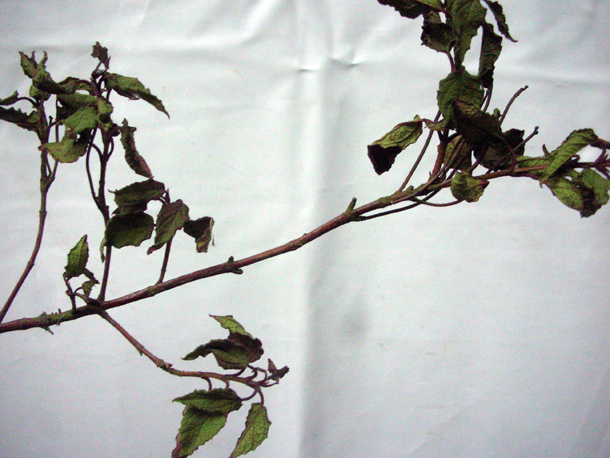 It is said that the breeders took 10 years to achieve this cultivar. Hellebores being one of the most promiscuous plants are hard to keep the same once you have grown one that you like. They take years to realise too. 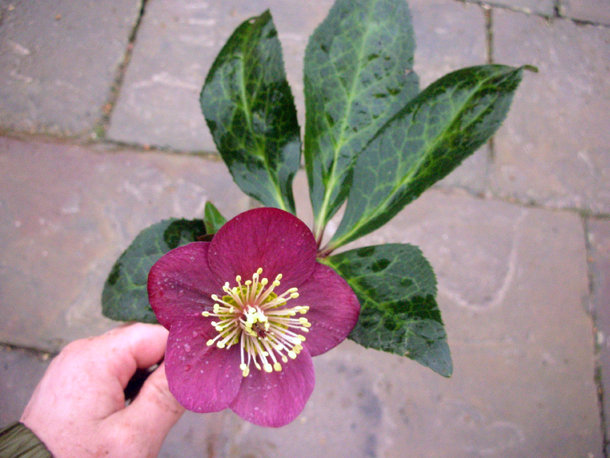 There are some very dedicated and enthusiastic hellebore plant breeders out there. 2. 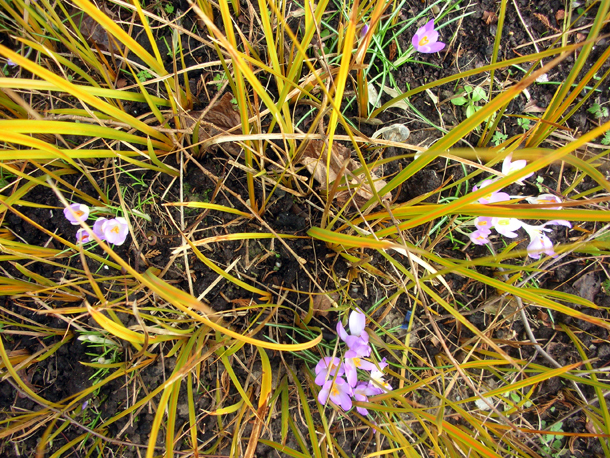 My second plant was Libertia peregrinus, which looks like a grass that the crocuses are pushing out through. It is in fact a type of iris from the Iridaceae family. Originally from New Zealand, it has saucer like white flowers. 3. Erythronium dens-canis (Liliaceae family). 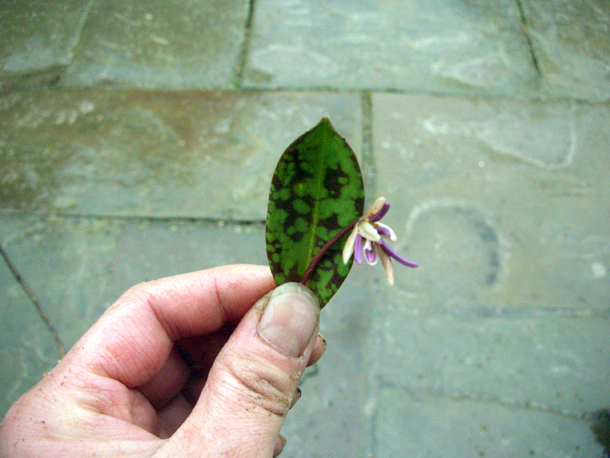 This very exciting dog tooth violet is named so because its root are hooked like a canine tooth. 4. Cyclamen coum (Primulaceae family). These are the spring flowering types of cyclamens, C. Hederifolium being the common autumn one. Lewis the gardener had the idea of sowing these in the cracks of the upper moat wall, and we hope that it will opportunistically self-sow itself there. 5. 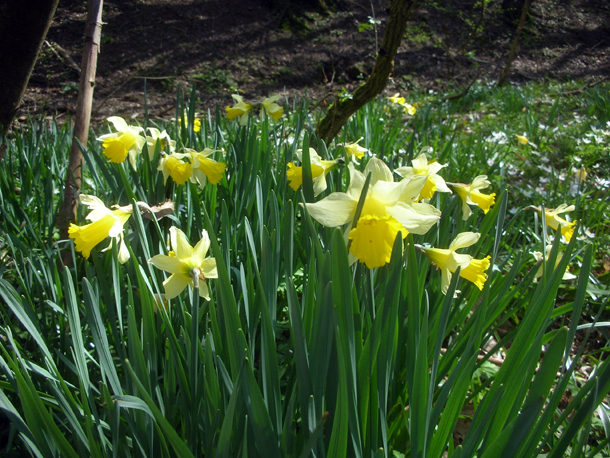 Narcissus 'Tazetta' (Amaryllidaceae family) are the also the daffodils known as paper white (maybe because they dry out like paper). They have the most fragrant and one can often catch the smell of them in the breeze as you walk past them. 6. 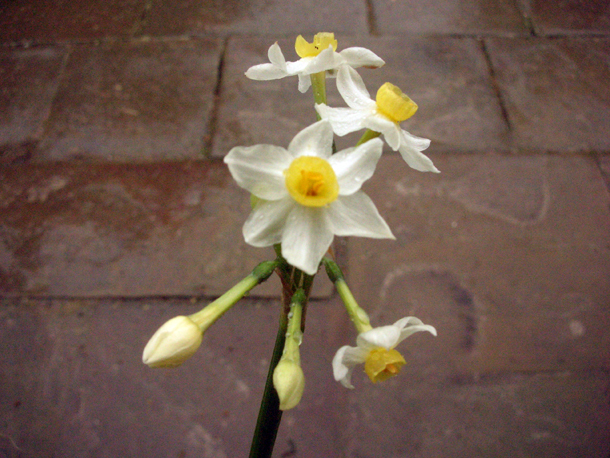 Narcissus pseudonarcissus, one of the only native wild daffodils. 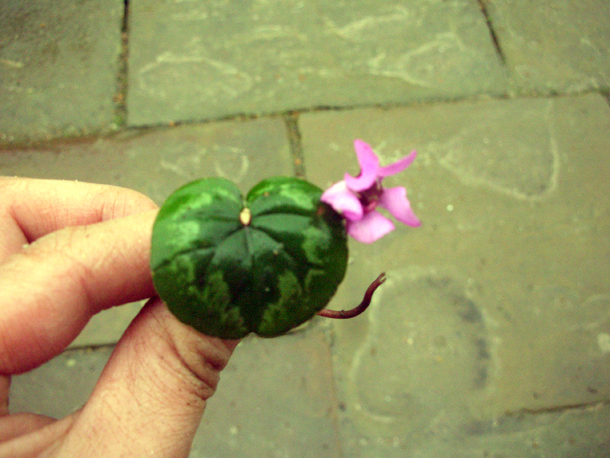 Smaller in nature to many of the cultivated variety. 8. 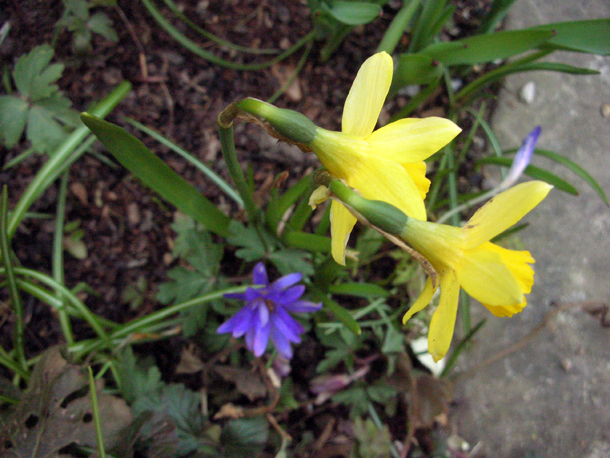 Narcissus'Tête-à-tête' above a beautiful purple anemone. 9. Narcissus cyclamineus this tiny daffodil has petals (the outer perianth segment part) that look like its ears that have been blown back. 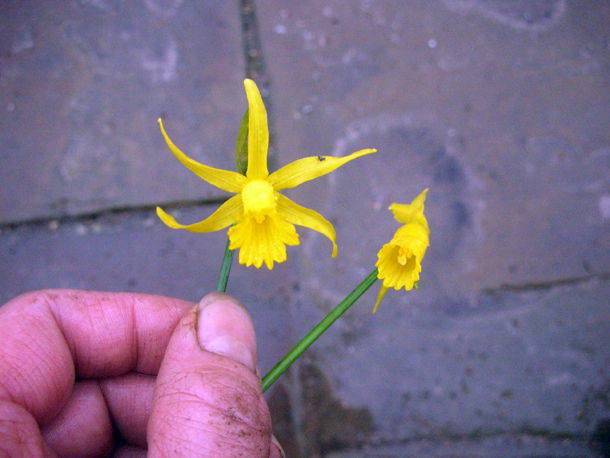 There was also a Narcissus bulbocodium which is another small one that has a hooped petticoat like corona (the trumpet part of the daffodil). 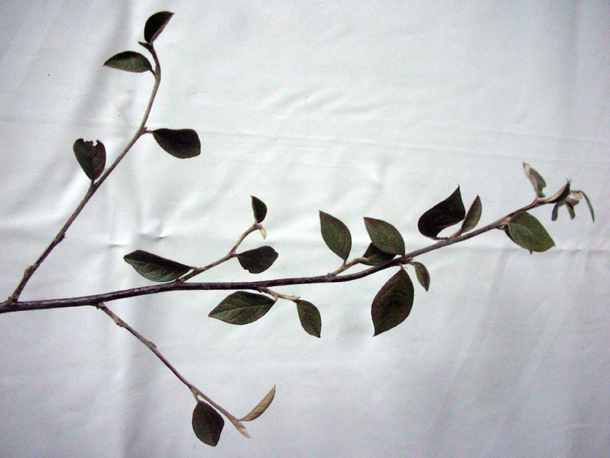 It's petals are less opaque and looks like it has a certain fragility. 1. 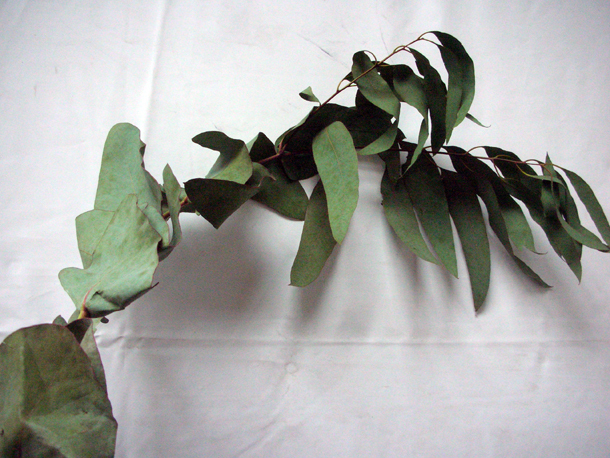 Eucalyptus gunnii (Myrtaceae family, endemic to Tasmania). It's not so clear in this photo, but it is interesting how the leaves when they are young start off round and then become these long slender shapes. It is exceptionally cold tolerant and can put up with temperatures of -14°C. It doesn't like chalky/ sandy or overly wet soil. It produces a sap that has been compared something akin to maple syrup which apparently when it ferments is like apple cider (mmm). This featured in my a sumptuous feast of plants post this year. 2. Ceanothus 'Puget's Blue' (Rhamnaceae family), many of them originate from places like California, their hardiness is borderline and a hard winter can knock them out. This cultivar has an AGM award. 3. Prunus persica 'Periana' (Rosaceae family) aka Peach. 7. 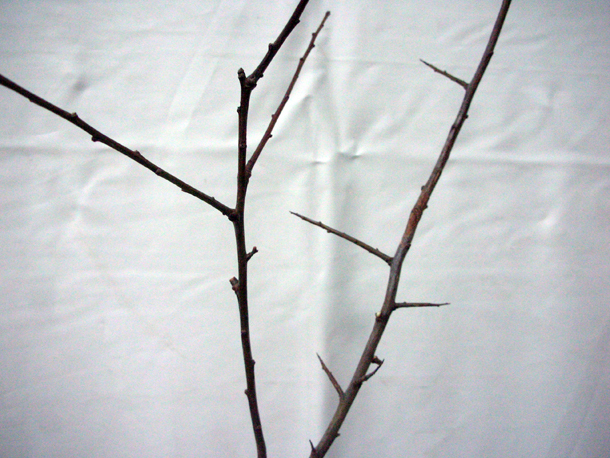 Prunus spinosa aka Blackthorn, the great hedgerow plant that gives us sloes. 8. Cotoneaster franchetii (Rosaceae), this is a bigger broader leafed one native to southwestern China, northern Myanmar and northern Thailand. 9. Itea ilicifolia (Iteaceae) always elicits admiration. They have holly like leaves and chandeliers of fragrant greenish white flowers. 10. Cistus corbariensis aka Rock Rose (Cistaceae family). 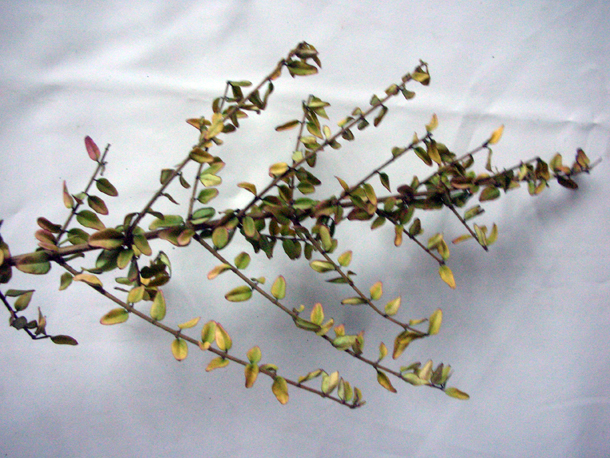 Has shiny green leaves and white flowers. 13. Olearia solandrii aka Coastal Daisy Bushy (Asteraceae family) has appeared in the evergreens ident. It is as its common name suggests is great for maritime conditions and is a good wind breaker. 14. 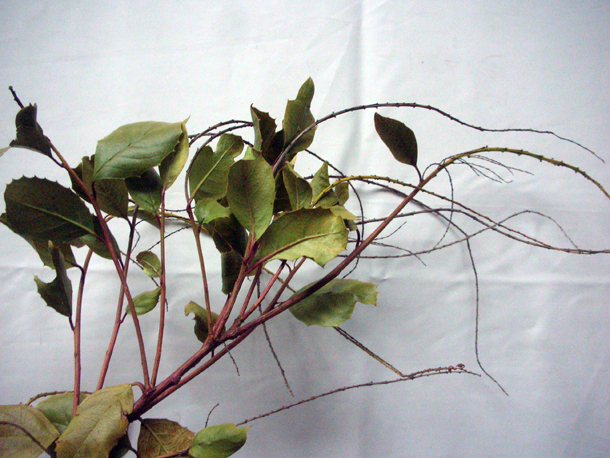 Hydrangea anomala subsp. petiolares is a climber. The ideal situation for them is degrees of sun and shade throughout the day, but they are great for shady walls. Weather: Finally warmer again today. Sunshine. Roots like the juicy white one at the bottom is ideal. Repotted some Phlox 'Admiral white', as these are stock that has not been sold yet since last year, some of them are burgeoning the pots and ideal for splitting and making into new plants. 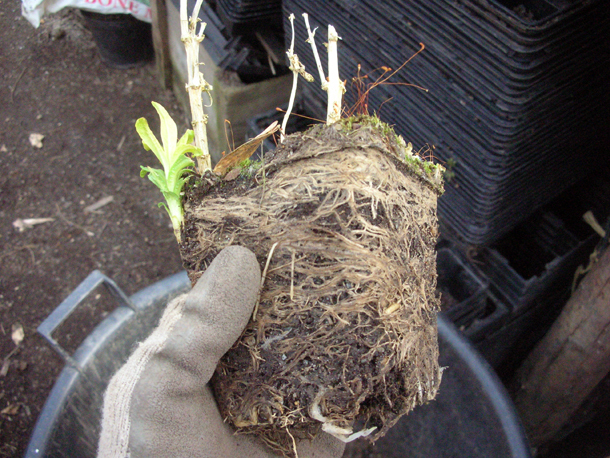 I also took root cuttings of these, I take the thickest & whitest (most vigourous) ones and place them flat on a bed of cutting compost in a box. Then I gently cover them with grit. 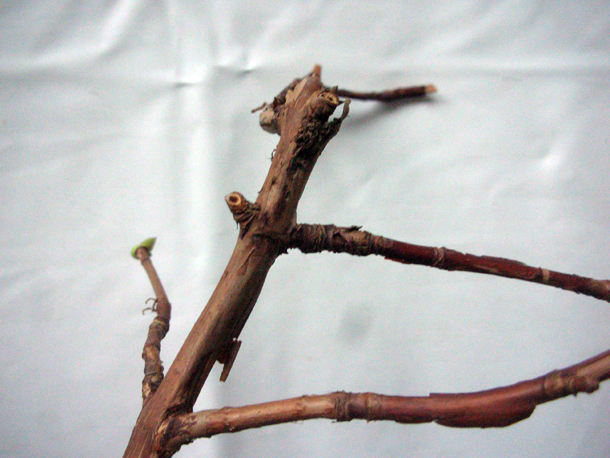 Phloxes propagate easily from soft cuttings, but the trouble with phloxes are that they are very prone to eel worm, but eel worms don't attack the plant basally, so it's safer for them to be reproduced this way. Also this allows me to do them en masse. It will take about two years for me to get a decent flowering plant. There is always a balance between planting firmly and not compacting the soil as much as possible, especially for things that are sitting around a bit longer, so it allows for good drainage. 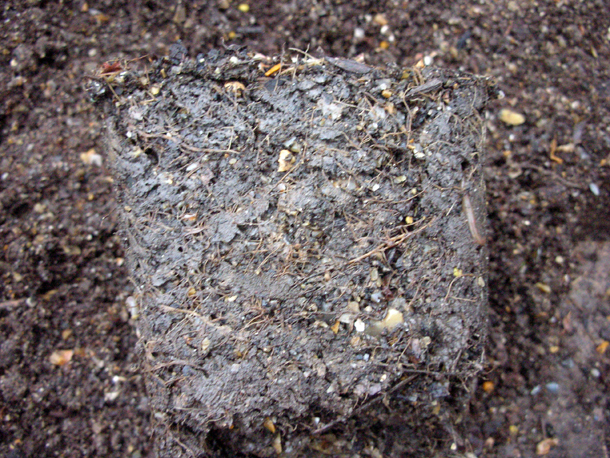 Below is a good example of a worm hole filled uncompacted soil. I had to discard a whole load of Carex testacea & Cyperus vegetus that didn't survive the winter. Carex are usually hardy but we were trialling these and will investigate more into it. The Cyperus if in the ground would have survived, but in pots the cold was able to get to their root balls too easily. Weather: Going up to 7°C. Rainy and cloudy for most of the day. Pricked out some Carthamus nemo seedlings. 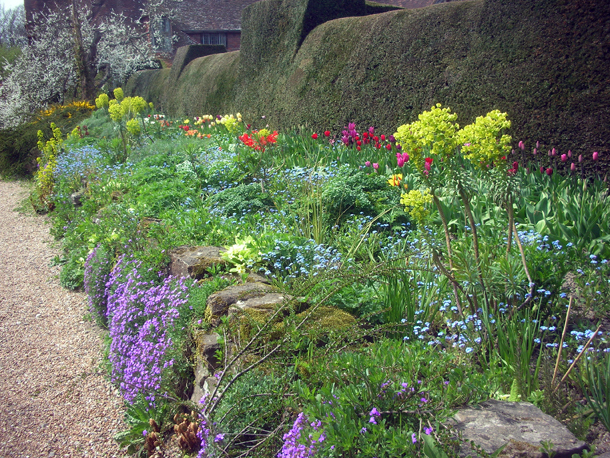 I had some Phlox 'Duchess of York' which I did the same for as above. Organised frame spaces, cleared and regritted areas, cleaned up some Verbascum olympicum, repotted and split some Geranium sylvaticum 'Mayflower'. Separated out a mass of Acaena novae-zelandiae that had grown into in each other and then made new plants out of stems that had rooted. 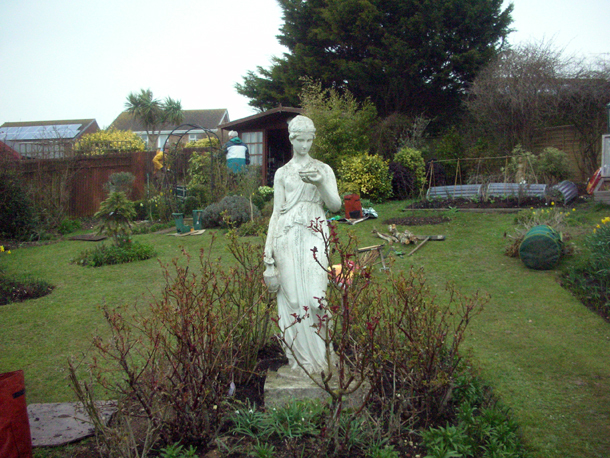 Cleaned up pots of Helianthemum 'White Bride', weeding and giving pots a fresh dressing of soil if necessary. Weather: Still quite sporadic, windy, bits of rain, sun. I shown how to print out labels, so I labelled and did more reorganising of plants, handling Ceanothus 'Puget's Blue', Achillea 'Lucky Break', Aconitum orendsii, Thalictrum Elin and Ballot pseudodictamnus. I have been working in the nursery for the past two weeks, getting a closer encounter to the plants we use and grow. The nursery grows 90% of the plants that they sell and buy in the other 10% from a variety of sources, including niche other nurserymen and women. Weather: The nicest day that it has been for awhile, very sunny but strong winds. 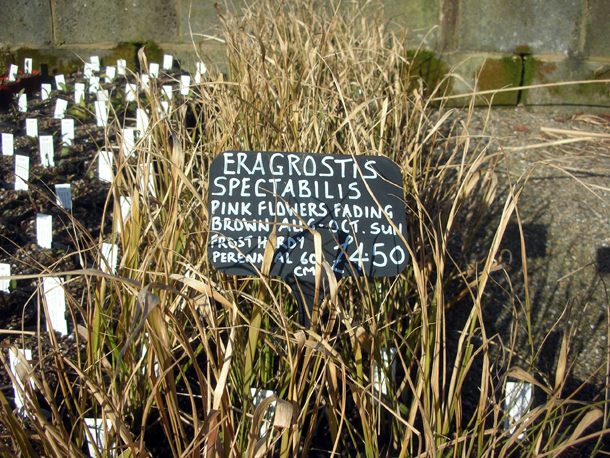 I potted up some Eragrotis spectibilis grass from 4" to 1.5 litre pots, and some Gladiolus ssp. byzantinus from small blacks to 4" pots. Weather: It was alright to begin with but then the wind picked up quite gustily. Repotted some Echinacea purpurea 'Rubenstein' (which has an orangey cone), Anemone hupehensis var. japonica. We use soil mix no. 2 to repot our plants. No. 1 is for seed sowing, no. 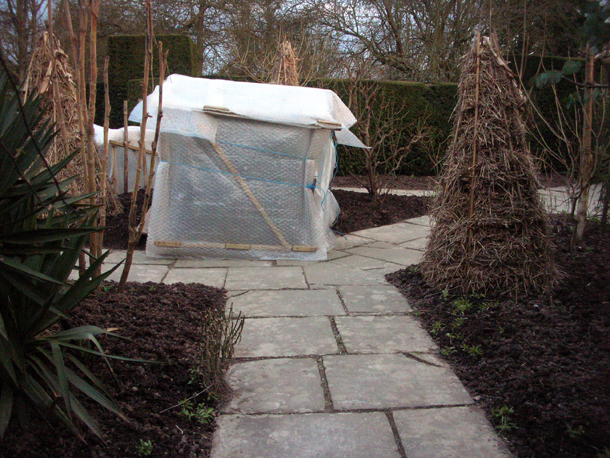 3 is for trees and shrubs and then there's old soil mix and cutting compost too. 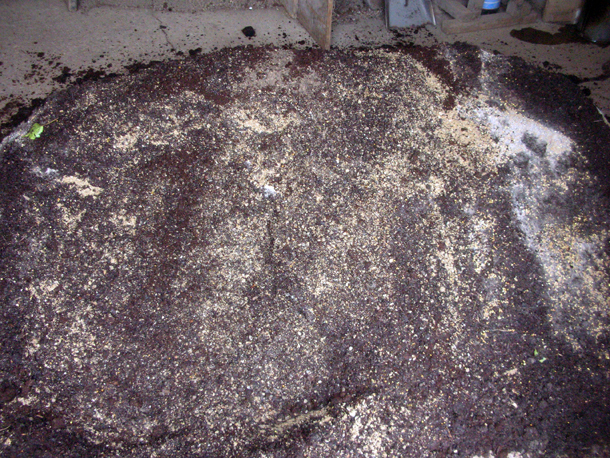 Ingredients put together to be mixed, it includes grit, osmocote and bark. 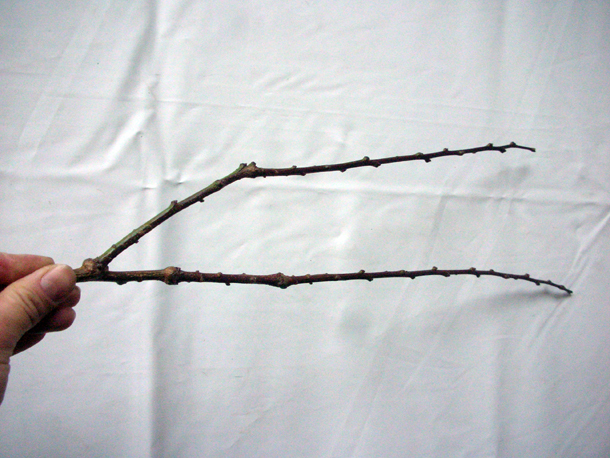 Shape of the spade from intensive mixing use. Weather: 2 - 4°C. Cold, windy. Flurries of light snow at intervals, not enough to settle though. Pricked out some Cynoglossum (Borage family) and put into small pots which we call small blacks. Also repotted some Dicentra spectabilis, Dryopteris cristata, and Polystichum setiferum 'Herrenhausen'. For the plants that we do buy in, we noticed just how much peat is still used. We remove as much of this as we can, to sit them in our own soil mix. 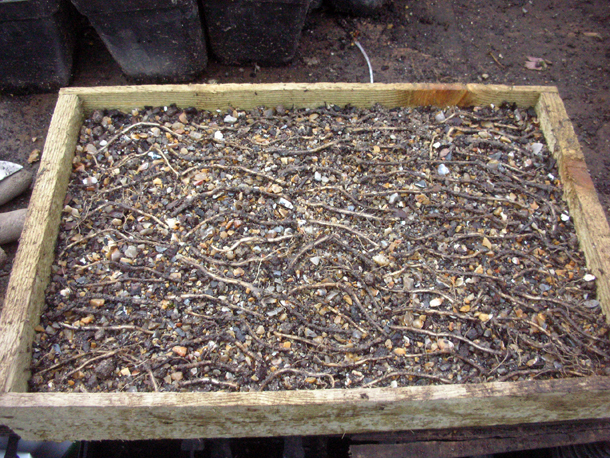 Which is a mix composed to help the plant root more easily when it is transplanted into the ground/ garden. If the plant is bigger we gently jiggle out the roots a bit to help invigorate the plant to root more easily in the new soil. 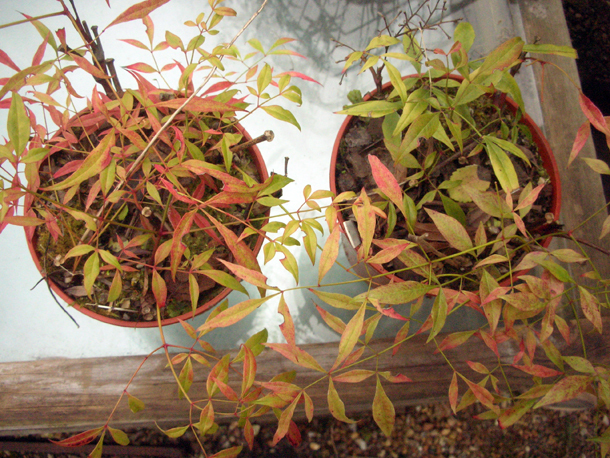 We worked on pricking out a lot of our own cuttings today, which included Nandina domestica (picture above), Buddleia davidii 'Dartmoor', Deutzia carminea 'Rosea', Parahebe 'Snow Clouds' and Azara serrata. 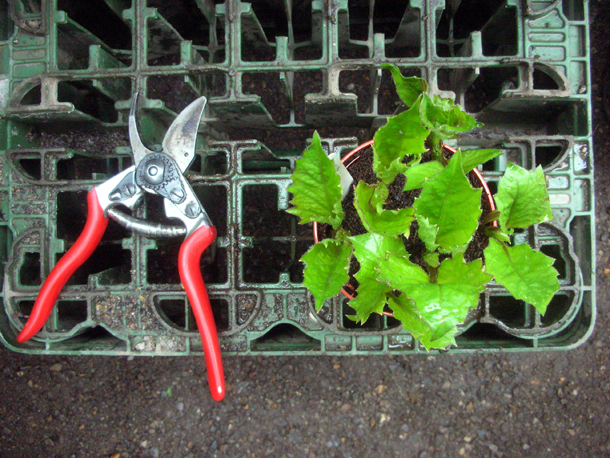 Gardener James pointed out that it is interesting how young cuttings seem take on the same vigour as their parent plants even at such an early stage. All newly repotted plants are put under the shelter of a cold frame and they are most priority of needing to be shaded when the sun comes out. Weather: We were at Seaford, it started at 2-3°C going up to 7°C. It was windy and quite heavy rain in between. We have a volunteer called Frank who comes to Dixter most Thursdays, who almost always brings us treats and often help make our mess room a much nicer place. He lives in Seaford and has a garden on chalk. As the soil at Dixter is clay, Fergus thought it might be a good idea that we gardened on something different. 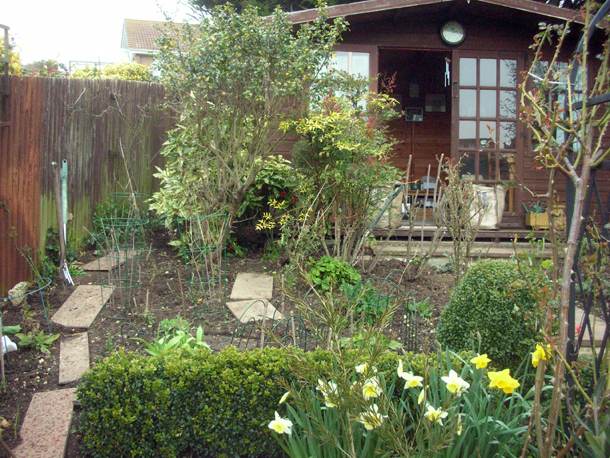 So a team of us went there and it was like Ground Force - the garden makeover show. The interesting additional challenges were that it is also near the sea, quite exposed and on a slope. Frank generously let us upheave his garden, rearrange it and make new plantings. One of my favourite bed composition at Franks was one at the right of this statue that had a Wollemia nobilis - one of the oldest known tree species in the world that looks wonderfully prehistoric, with wallflowers underneath and some hot pink anemones. 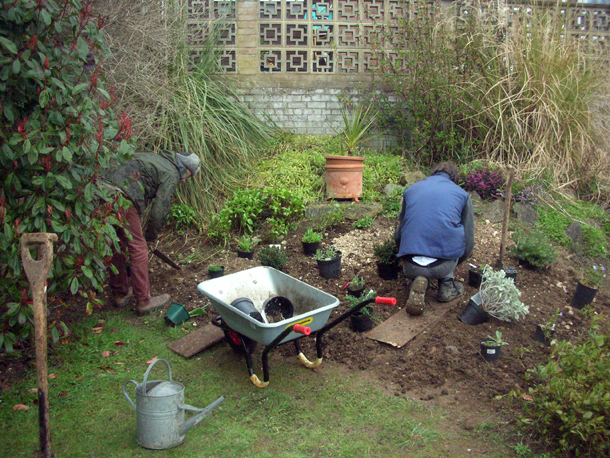 Yannick and James set about working on Frank's front garden, expanding an existent bed and adding more plants to it. Lewis set about making a structure out of bamboo cane for Frank's broad beans. There was a bed with a Eucalpytus tree that was not doing too well, so we removed this and replaced it with a Malus hupehensis. Me and Rachael decided to work on the bed in front of his summer house. As we were weeding it out, we noticed that a few of the shrubs were not doing too well - an Escallonia, Cistus and a rosemary. Frank was quite happy for us to take them out, and this helped open out the view from the summer house more. 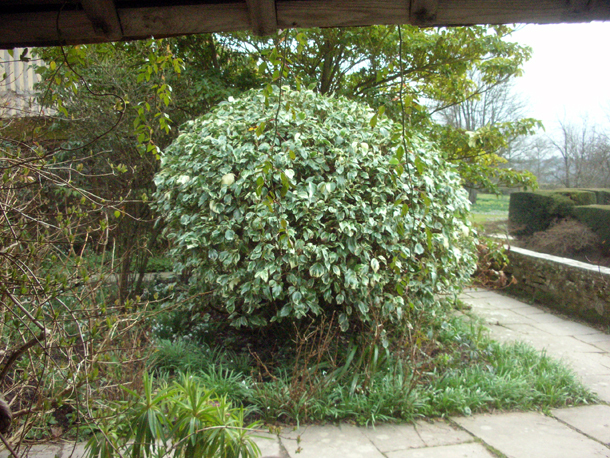 We re-positioned plants and pruned the Aucuba japonica at the back which was following a good shape but needed a little trim. There are already plants like Helianthus and Hemerocallis - a warm yellowy orange theme going on there. We decided to enhance this by planting in some heleniums, and have asked Frank to scatter Calendula 'Indian Prince' and Eschscholzia californica seeds amongst the perennials. 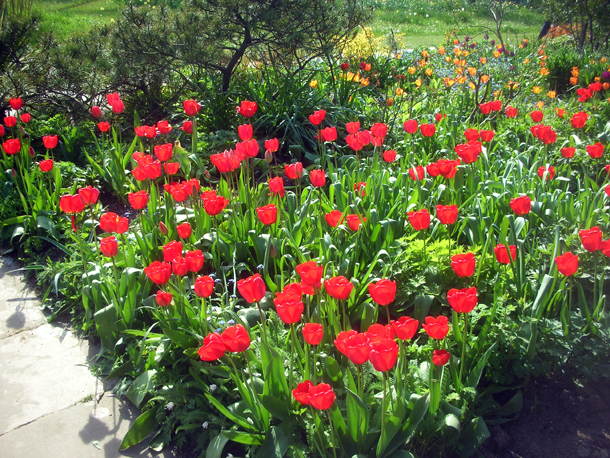 There was also a deep dark purple Centaurea, and some giant poppies and roses in the bed. We also convinced him to keep his Vinca in there for now so that their blue flowers would hopefully punctuate the sea of orangey yellows. 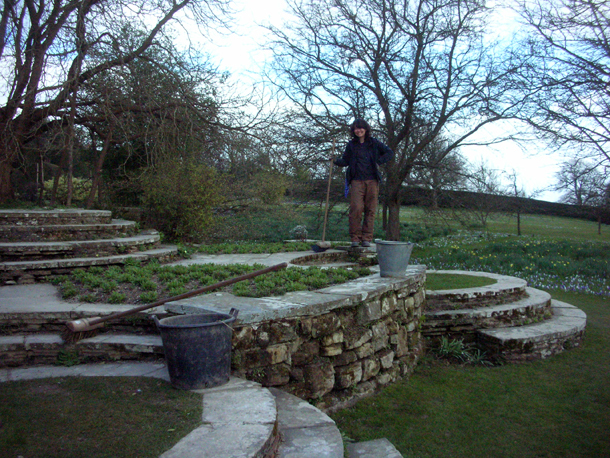 We also replanted some self-sown parsley and some Dianthus alongside the steps. Can't wait to see the outcome of it later on this year. Weather: A bit warmer but still with a slight nip in the air. The sun broke out from time to time and it was around 7°C. We have been bringing some dahlias on early for a trial at Wisley by potting them up and placing them on the heat bench in the hot house. Their leaves are growing slightly curled and Fergus is worried that they might have a virus. So just on the side of caution he has asked for me to make cuttings of them because there is a chance they will grow out of it too. These dahlias have been set aside in a cold frame and a new batch has been put on the heat bench along with the new cuttings. 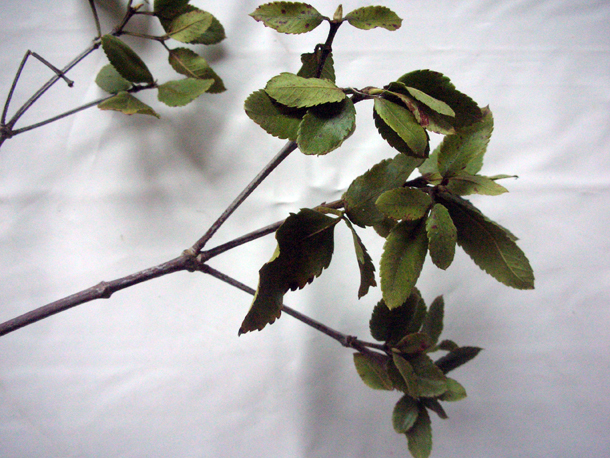 The cultivars are the giant 'Emory Paul' and 'Witterman Superba'. 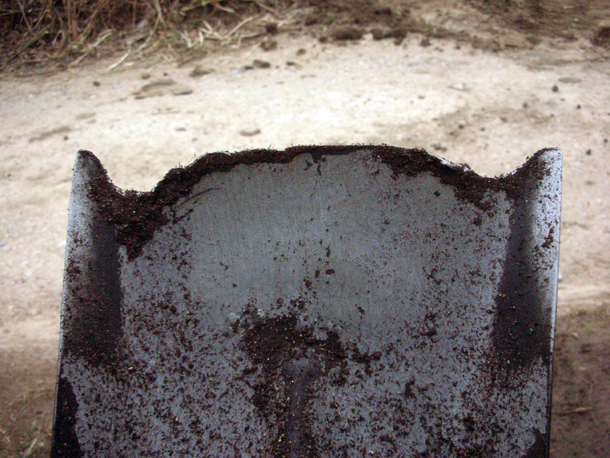 The cutting medium we used was biochar. 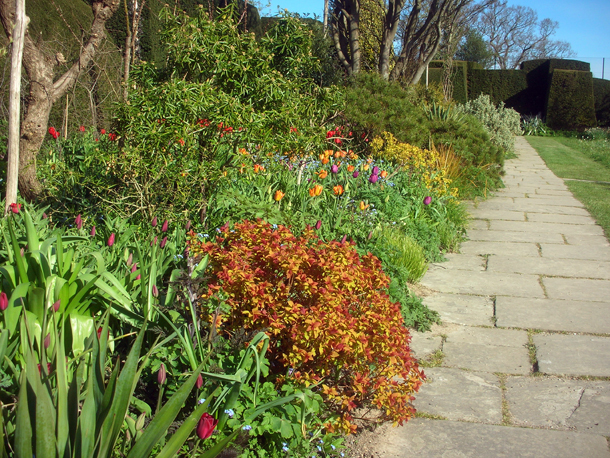 Then I helped weeding under the hedges, and neaten up the last sections of the Long Border. 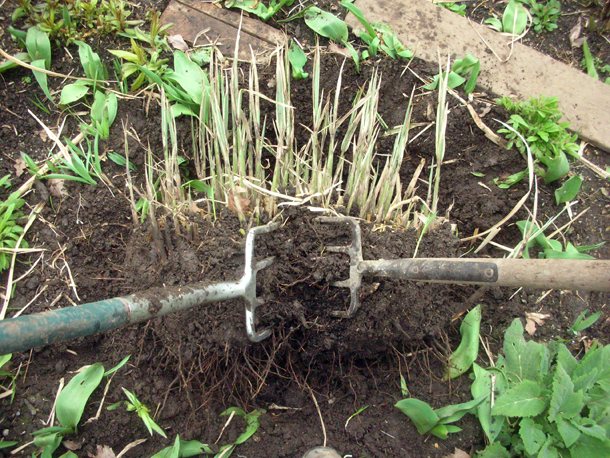 I dug up a Miscanthus sinensis 'Cosmopolitan', split it in half and replanted just half of it back into the ground. This is to help control the size of the grass so that it doesn't overtake too much. Weather: 5 - 6°C. Cloudy most of the day with the odd outbreak of sun. I splitted up a half of Miscanthus sinensis 'Cosmopolitan' that I had dug up yesterday, into further smaller pieces with 2 or 3 growing points and potted them up into 4" to 3½" pots, in a number 2 soil mix. Weather: The winds had finally abated today which made 6 or 7°C not so cold. 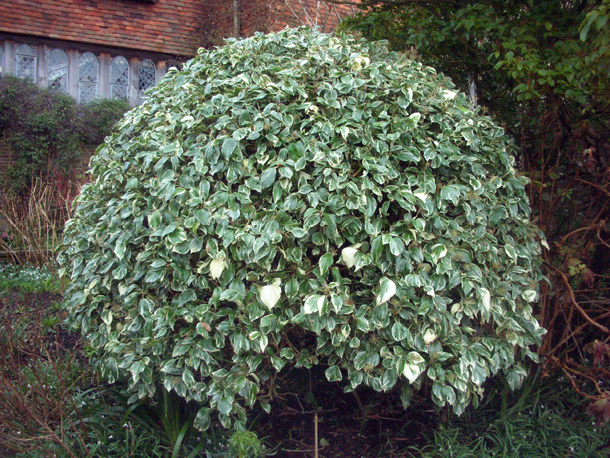 Last Friday I had begun pruning the dome of Hedera algeriensis 'Gloire de Marengo' - a handsome variegated ivy. It is at these moment that you feel that part of being a gardener is giving haircuts on a bigger scale. 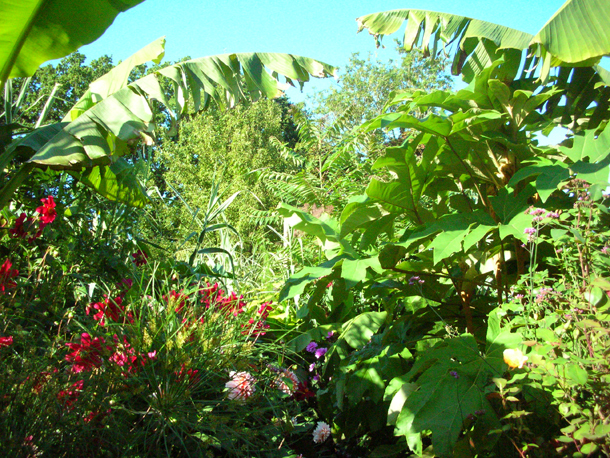 I was told by one of the other gardeners that this was one of the harder levels of pruning. The aim of it was to diminish the size substantially and to cut out any overtly long pieces or leaves that had reverted to its species form. I thought I had finished pruning but Fergus wanted it even shorter and for more 'holes' to be made into it. The reasoning was, he explained to me, was so that more light can reach the middle of the bush, and for growth to happen more from the inside. This would help keep the shape better for longer and retain it for 15 years instead of 5. 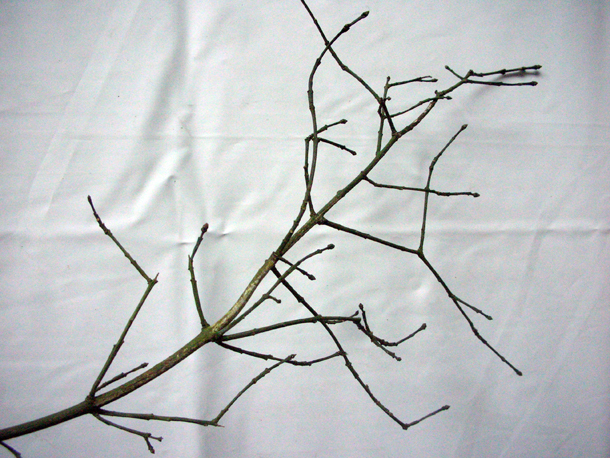 Any long lanky green stems would just go woody by the next year, so it was good to cut a stem back to just before it started to go brown, but not too far back to cause it to revert. 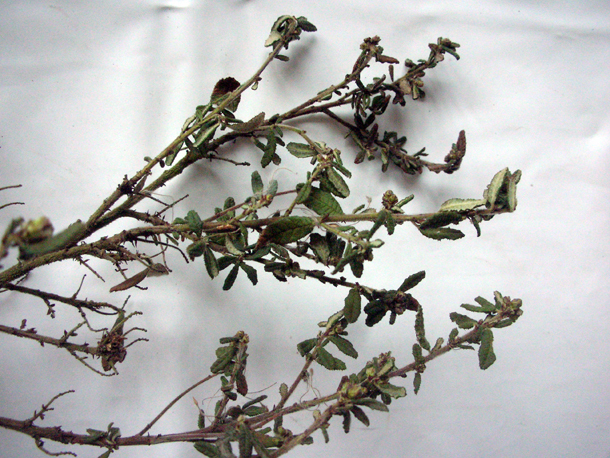 He said that this may mean that it might look like 'what on earth have you done to the plant', but it was more beneficial for it.